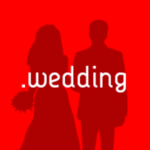 .wedding is a GTLD that was proposed in ICANN's New gTLD Program. It was delegated to the Root Zone of the DNS on the 15th October 2014, completing the successful application for the string. .Wedding is a new generic top-level domain targeted to the wedding industry, including couple registries and personalize websites, photo and video services, brands, and wedding industry vendors. .wedding was delegated to the Root Zone of the DNS on the 15th October 2014, completing the successful application for the string. A wedding has often been called the most important day of a couples life, signifying the beginning of a journey bringing two families together as one. Such an important day deserves to be remembered, and this is now becoming easier with technology (specifically the internet). Couples can now get their very own web and email address that ends in .wedding (instead of .com) to share their engagement photos, wedding registries, wedding day photos, and videos through their very own webpages. Additionally, brands and vendors can take advantage of a .wedding web address to have an easy to remember web address that is searchable and clearly identifies what they are all about directly in the URL. Top Level Domain Holdings Ltd. (TLDH), .wedding is one of 68 TLDs that the company has filed for on its own behalf. This applicant submitted a Public Interest Commitment, which can be downloaded here. Donuts (Wild Madison, LLC), one of 307 TLDs applied for by Donuts. This applicant submitted a Public Interest Commitment, which can be downloaded here. TLDH announced in a press release on 25 February 2014 that it has won the rights to the .wedding string in a private auction conducted by Applicant Auction. The sale price was not disclosed, but was over USD$2.2 Million. On February 26 2013, Top Level Domain Holdings Ltd. announced that it had entered into a funding agreement worth $15 million to be used in the case of auction for a specific unnamed TLD. The investor will not receive ownership of the TLD but a share of future revenues. TLDH did not name the TLD that the funds are directed for, and it is in 11 head to head contentions and 12 featuring more than one contender. On the 24th April 2014, Top Level Domain Holdings received a Registry Agreement signed by ICANN for .wedding after passing the Initial Evaluation. ↑ ICANN delegated strings Retrieved 5th December 2014. This page was last edited on 18 November 2017, at 11:52.